You know what’s the next best thing after the French breakfast staple, crepes? It’s the Mille Crepes which are now slowly taking Manila by storm and we have never been this #blessed. We have all been accustomed to the good, old fashioned, pancake-like crepe that fills us up at basically any time of the day we desire. Pair it with a hot brewed coffee and you’re in for an awesome, legit French treat. But could you imagine a delightful, filling piece such as this one being taken to a whole new level and given a grand twist? Head to the nearest Paper Moon Café and see this for yourself! Mille literally translates to “a thousand”. Used in the context of tasty, satisfying crepes, it relates to 20 layers of mouth-watering, uniquely prepared crepes with light, savory crème in between then topped with a caramelized crust. The Mille Crepe concept came from one of Tokyo’s specialty cakes royalties, Emy Wada who is also the mind behind the infamous New York dessert store, Lady M. Wada retired in 2013 after 40 years of being in the industry. 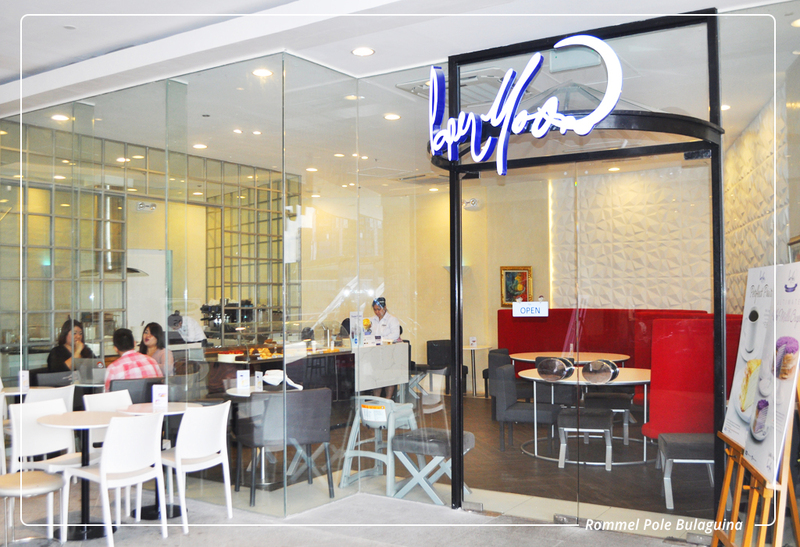 It was Viva Entertainment’s main man, Vic Del Rosario, who convinced Wada that the Philippines could be a viable market for Paper Moon recipes and it’ll undoubtedly become a big hit here just like the other Japanese brands before it. He envisions one day that mille crepe will be an alternative for cakes. 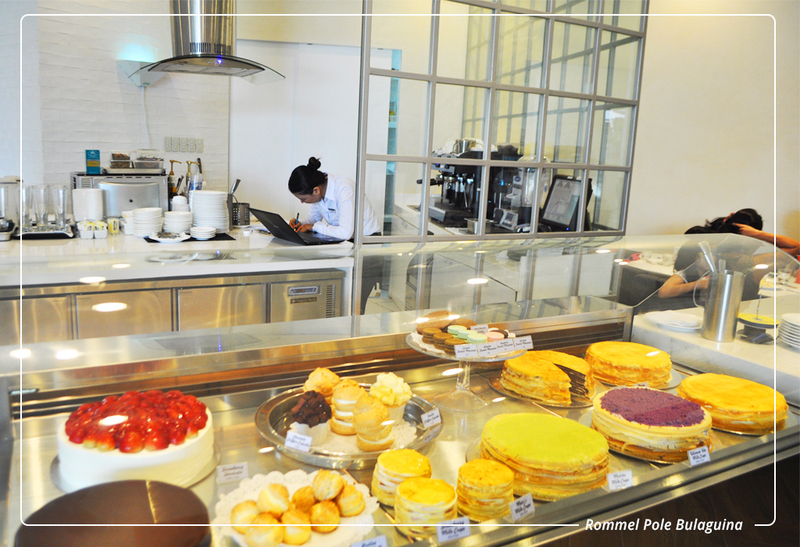 As of this writing, the newest branch was opened in Uptown Mall, Bonifacio Global City, Taguig which you can see the neat and crisp interiors from the outside with its clear, floor-to-ceiling glass walls. The insides is basically white in every angle accentuated by art pieces hanging on the textured walls which were all handpicked by Emy Wada. Yes, she is very much hands on like that. The biggest accent is the blood red high back sofa right across the display fridge and counter. It’s like everything was carefully pieced together to project that less-is-more, minimalist and very inviting image. You can also see the small kitchen with mock exhaust fan behind the counter where the orders are being assembled. It’s mainly composed of colors white and silver which are very pleasing and easy on the eyes. The whole place is ideal for corporate meetings over coffee, students beating deadlines, and writers trying to finish a material. When trying out a new restaurant, I’d usually go for the original/ classic pieces like the Original Mille Crepe here. Now, people would usually think that it’s sickeningly sweet considering how it looks and how it’s being presented but to be really honest, the tasty layers of mille crepe balance off the light pastry cream producing a subtly sweet confection, just your right kind of sweet. I love how the paper-thin crepe melts in my mouth and blends with the cream. And, mind you, even a slice could be really filling! I tried it together with a cup of Americano which I prefer with a lot of creamer and sugar. That could be the perfect formula for a fine and pleasant day. They actually have a promo for this combo that’s only P260.00 and the coffee can be replaced with Lemon Iced or Hot Tea. I’ve also read in the news that our local ube or purple yam is already making it big in New York dessert stores and the demand is consistently increasing. If New Yorkers only knew that it’s basically all over the place here in Manila, they’d all be flying in as soon as possible. 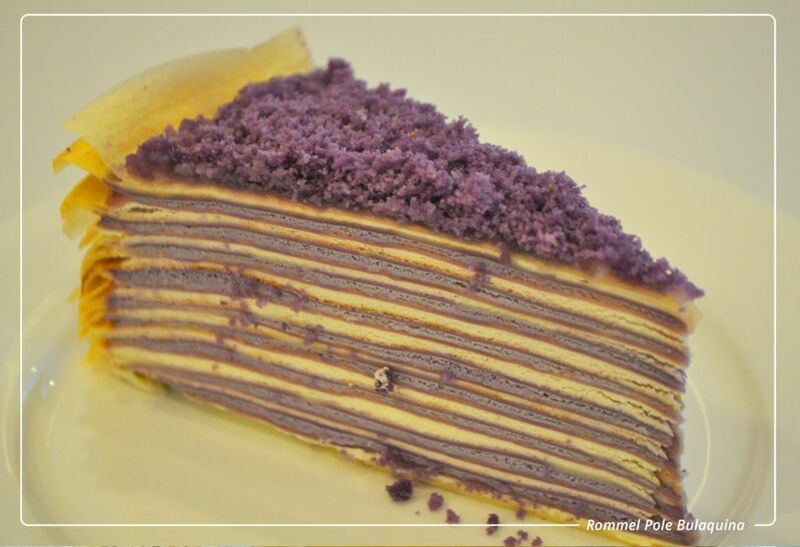 In time for Paper Moon’s first anniversary, they are launching their Ultimate Ube Mille Crepe and I was among the first few and lucky customers to try this one out. It’s practically layers upon layers of delicious crepes sandwiched in homemade purple yam pudding, fresh cream topped with macapuno glaze and ube chiffon crumbs. 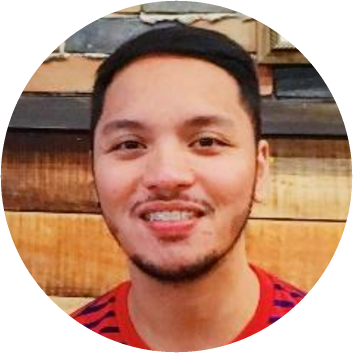 It’s a foreign piece made entirely Pinoy! Next piece I tried was their Matcha Mille Crepe. Just like Ube, Matcha has been gaining a lot of attention recently and even being celebrated as one delectable flavour with a Matcha Festival. And, yes, it deserves the public’s appreciation, all of it! I was told that Matcha is just one of the four variations of Green Tea flavour and it only got me so curious to know and try the other three! 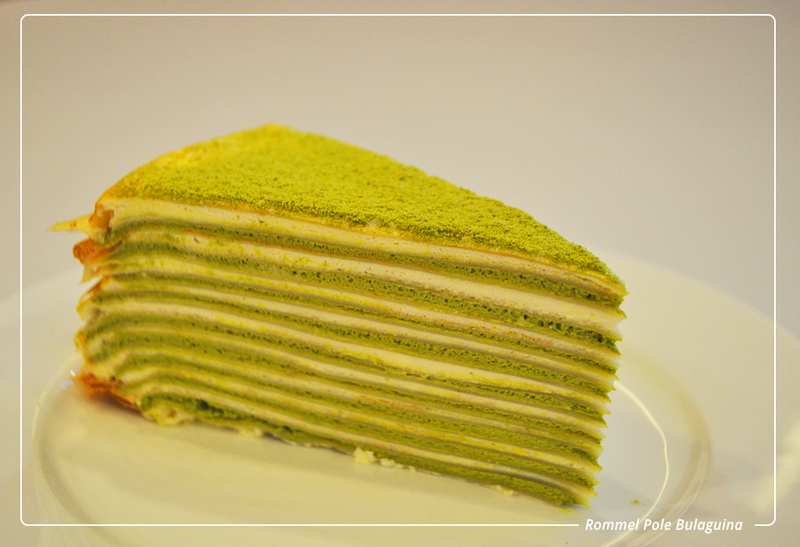 Matcha Mille Crepe is stuffed with subtly sweet, creamy and fine green tea powder, topped with pure matcha. This is positively a must-have for all those people who are in love with a bittersweet smack of matcha pastry cream. 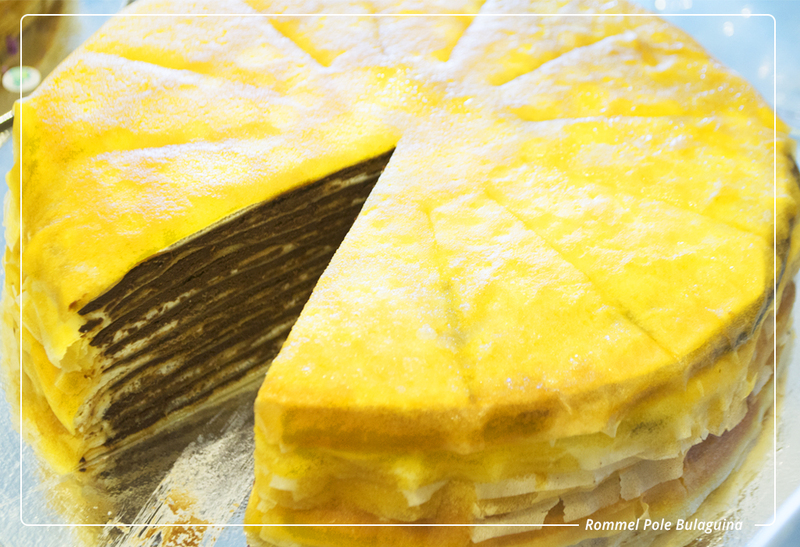 It gives you the right kick of sweetness and lightness in one mille crepe. Paper Moon Café is known for their mille crepe but they also have other pastries like this Strawberry Shortcake which is basically layers of light vanilla sponge cake and whipped fresh cream, with a bounty of fresh, imported strawberries on top. 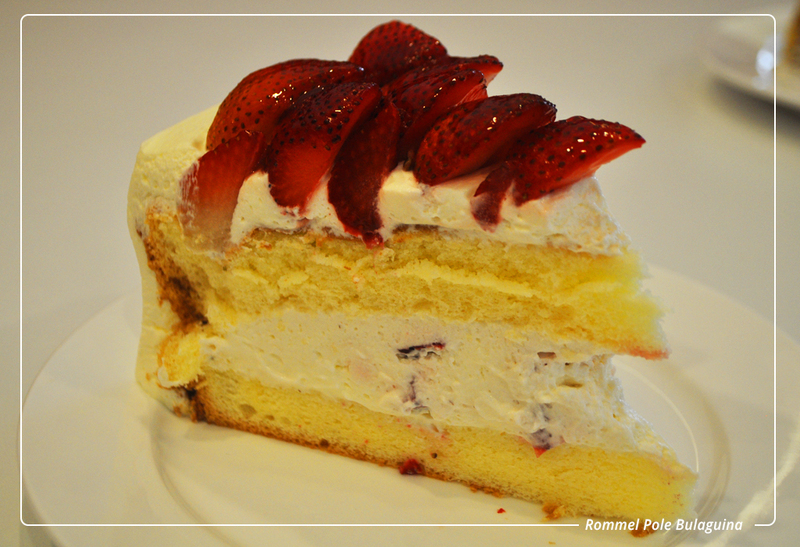 A slice costs P325 while one whole cake is P3000. My 2nd favourite next to the Original Mille Crepe is their Checkered Cake. I’m still puzzled until today as to how it was baked like a chess board but when I was eating it, all I could think of was how good it was up until the last bite. 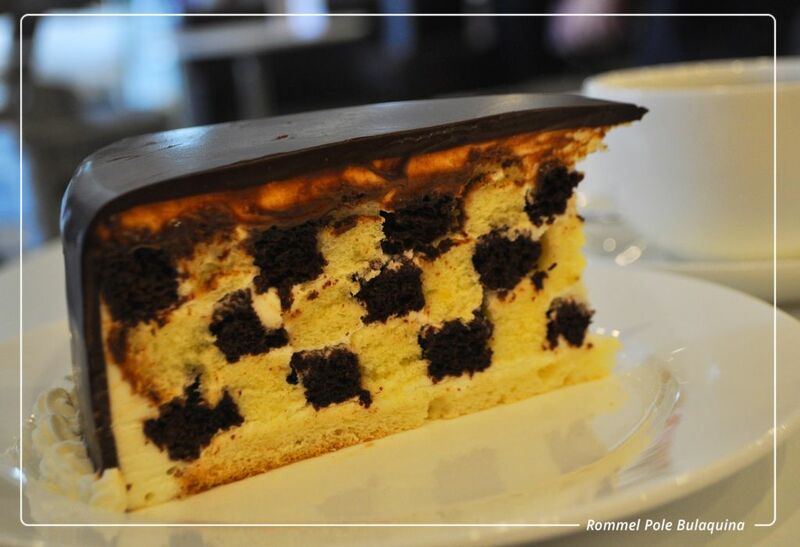 It’s an utterly delightful checkerboard of light vanilla and chocolate chiffon cake, tucked with fresh cream between the squares, all covered with a sinfully delicious dark chocolate ganache. They’re also serving Choux Fromage; crispy, puffy golden choux pastry with a delightful filling of cream cheese bavarois. French Macaron, available in Caramel, Chocolate, Raspberry and Pistachio. Delicate, hand-crafted meringue based confection made of ground almonds, some sandwiches like Croque Monsieure; a French favorite, hotdog sandwich of grilled ham and cheese topped with Gruyere and béchamel sauce and Ham & Cheese Ciabatta; a twist on the classic Parisian baguette, ham and emmental cheese ciabatta bread. It would be best to just try it for yourself. They now have 9 branches covering the entire Metro Manila and still working on putting up more before the year ends. I personally believe that it really would not hurt to splurge on food from time to time. You just have to be very picky on what and where you are going to do it. And, to tell you people, Paper Moon Café isn’t really a bad choice, not at all. Order from Paper Moon right now!